As a child, Chris Davis aspired to be an architect or writer. But first job — doing repairs at a Waimalu gas station — was more predictive. After graduating from the University of Hawaiʻi, he worked on the P-3 aircraft for the Navy. Now he's working to get the space shuttle flying safely again. One of the teams Davis heads developed shearography, an innovative technique that uses laser detection to ensure that foam doesn’t come off the external tank during launch. Another team studies how debris impacts the shuttle’s thermal protection tiles and how much damage the tile can tolerate. 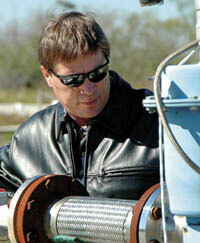 Davis and his crew won a Group Achievement Award in 2004 and he received NASA’s Space Flight Awareness Award this year. Davis calls joining the Kennedy Space Center staff in 1990 and receiving his MS from the University of Central Florida three years later a dream come true, but it’s not his only interest. He is a volunteer with in a Red Cross Disaster Assessment Team. He also trains in kung fu with the Wah Lum Northern Praying Mantis Performance Team, which does group demonstrations, particularly during Chinese New Year. The best thing about life in Florida is living in an uncluttered natural area near the beach, Davis says. Still, he values the quality he says Hawaiʻi culture instilled in him. Charles Michael Brotman fell in love with acoustic guitar at age 12. This year The Recording Academy fell in love with his take on slack key guitar. 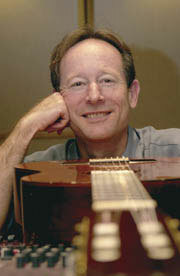 Brotman produced and performs on Slack Key Guitar Volume 2, which won the academy’s first Grammy awarded in Hawaiian music. Slack Key is a compilation of performances by Brotman, Mānoa music instructor Jeff Peterson and others. Son of a Maui paniolo, Peterson has played with artists from Eric Clapton to James Galway to shakuhachi master Riley Lee. Brotman also has a background in classical as well as cool jazz and world music. He performed with bands throughout Washington state during his teens and attended Cornish Institute and The Evergreen State College before moving to Hawaiʻi in 1976. After graduation, he taught guitar at Mānoa for nine years, performed extensively in Waikīkī and founded guitar trio Kohala, which tours the U.S. and Japan. After moving to the Big Island in 1990, Brotman founded Palm Records and built Lava Tracks Recording Studio with sister Jody Brotman. CHANEL, a major exhibition curated by Harold Koda, continues at the Metropolitan Museum of Art in New York City through Aug. 7, 2005. The exhibition examines the history of Gabrielle "Coco" Chanel’s Maison de Haute Couture 34 years after the death of the French orphan turned fashion authority. "In creating a wardrobe for herself, Chanel invented an idea of the modern woman," observes Koda, who also co-edited CHANEL, the book accompanying the exhibition. Koda has been curator-in-charge of the museum’s Costume Institute since 2000, but he served as exhibition assistant and co-mounted 12 noted exhibitions during previous affiliations. He also spent stints as a Sotheby’s rare book administrator, Spy magazine editorial consultant and Fashion Institute of Technology curator and director. He is a two-time recipient of Council of Fashion Designers of America awards. Koda’s exhibitions and books have examined body-transforming fashion, explored Orientalism and classical influences and chronicled the work of Armani, Dior, Adrian and other influential designers. Chanel, he says, "remains synonymous with uncompromising refinement and seductive flair." As an undergraduate at Mānoa, Mitch Kaʻaialiʻi learned the importance of good communication in the classroom and the value of teamwork on the football field. The Letterwinners Club member then honed his business skills in the College of Business Administration. Now he's using all he learned at UH both on the job and as an alumni leader. "The work I do with CBA Alumni and Friends and the UH Alumni Association is a chance to give back to UH," Kaʻaialiʻi says. "As a scholarship athlete, lots of people were really generous to me with their time and advice. Now I have a chance to get involved with UH and the community." With an impressive new dean at the helm of the business school and an energetic team in place in the UH Foundation's Office of Alumni Relations, it's an exciting time to be involved, Kaʻaialiʻi says. 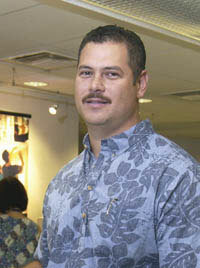 When Humphreys relocated to the University of Hawai’i at Mānoa, he offered a graduate assistant position in his lab to the student who had always stood out. "Joffre loved to think, ruminate, talk about and discuss conceptual and intellectual scientific issues more than any of my other students," he says. Baker worked almost daily with Humphreys for six years. "The training I received in Tom’s lab prepared me well for a career as an independent scientist. He takes a deeper and more analytical approach to data analysis than most of the other scientists I have interacted with throughout my career," Baker says. "I would like to think that some of that trait has rubbed off on me." 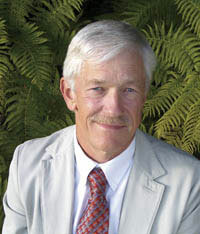 He spent the next 12 years at Genentech in California, where he became director of cardiovascular research, oversaw a number of research programs and designed the company’s functional genomics program for cardiovascular, oncology, immunology, endocrinology and pathology research. In 2000 he co-founded Genomic Health, overseeing science and technology while colleagues Randy Scott serves as CEO and Patrick Terry manages consumer advocacy and government affairs. The company focuses on cancer, harnessing powerful new technologies that monitor the activities of hundreds of genes. "The company needs to be sophisticated about both the molecular biology of cancer and about the exploiting capabilities of the best genomic technology platforms," Baker says. It received public attention for the February 2004 release of a test called Oncotype DX, which showed promise in clinical trials. The 21-gene test indicates the risk that primary breast cancer will become metastatic, or spread to other areas. "The reason the test is important is that it helps inform the patient’s decision about whether chemotherapy is right for them," he explains. Most breast cancer patients with estrogen receptor positive, lymph node negative breast cancer will not develop metastatic disease. Oncotype DX identifies the 4 women out of every 100 who are likely to suffer recurrence, thus saving the others from toxic side effects associated with the chemotherapy. Baker and his colleagues are now pursing tests that predict drug response for patients with other forms of cancer. Humphreys couldn't be more pleased. "Whatever impact Joff’s experience at UH may have had on his success, I am proud of his accomplishments. He was smart, thoughtful and energetic, and that is what has carried him so far." Motivation: "Education established the basis from which Sarah and I were able to realize so much more than we had ever dreamed"
UH Mānoa students gain career and life experience thanks to the generosity of UH Distinguished Alumnus Francis Sogi and his wife Sarah. Their foundation finances summer internships at museums on both coasts and a major law firm in New York City. Born in 1923 to Japanese immigrants, Sogi grew up on a Big Island farm and graduated from Konawaena High School. Three months after he enrolled at UH Mānoa, World War II intervened and his ROTC unit was called to active duty. When soldiers of Japanese ancestry "were summarily dismissed when we were classified as enemy aliens," he volunteered for military service to prove his loyalty. Sogi later completed a UH business degree, moved to New York (where his high school sweetheart was an occupational therapy scholarship student at Columbia) and earned a law degree at Fordham University in 1952. The Sogis married and he practiced corporate and international law with New York's Kelley Drye and Warren, spending three years as a foreign lawyer in Japan. 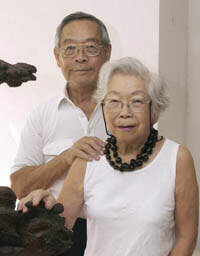 Upon retirement after five decades, the couple returned to Hawaiʻi in 1996. The internships "give back to a society that has been good and generous to us," he says. Since 1989, a Mānoa arts and sciences student spends the summer working at the Japanese American National Art Museum in Los Angeles. Several former interns now work in museums. The $225,000 Francis Y. Sogi and Sarah M. Sogi Asian Pacific American Studies Fellowship allows Mānoa ethnic studies majors to earn college credit while training and studying in the Smithsonian Institution’s Asian American Studies Program. The newest internship places a third-year UH law student in the summer associate program at the 400-attorney Kelley Drye firm. In 2004, students ranked it best among more than 150 firms nationwide. Sogi believes both experience in a major international practice and life in a large, mainland city are valuable. "Students bring back a broader vision of the future, and it will be good for the future of Hawaiʻi", he says. "We hope to continue with grants and scholarships for education and research aimed at a better understanding of Asian Americans in our country, as well as for the betterment of students in Hawaiʻi."